I know that the more discerning blogger would say that instagram posts are THE DEVIL and should be avoided at all costs because – quote from any #blogger chat ever – “I already follow you on instagram so why do I want to see all the same photos all over again” and I know, I know, all 1003 (insane number) of you basically spend your lives glued to my instagram feed but I thought I’d blimmin’ well do one anyway because stuff you discerning bloggers! I want to put photos up of things what I did and write about what I did too and this is kind of an easy way to do it. This week was a bit of a bitt-y week with bouts of extreme busy-ness and bouts of me being absolutely exhausted and flopping into bed at 10pm. On Tuesday I went down to Weymouth to do some work and my colleague and I enjoyed a yummy pizza at – a favourite of mine – The Stable, overlooking Weymouth harbour (which you can see in 9 and 10). 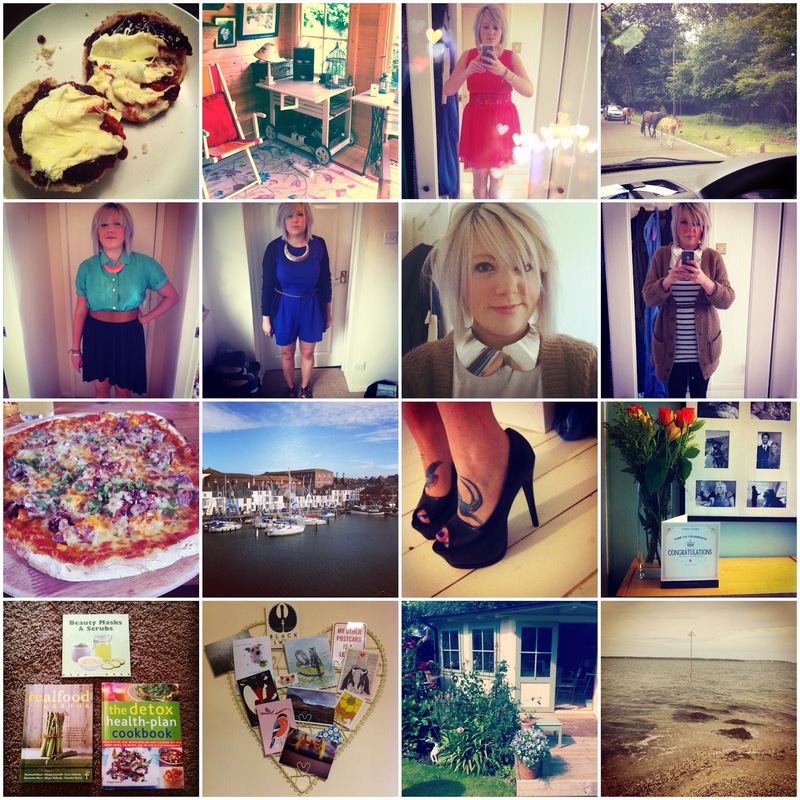 There are a few photos in here of work outfits – followers on Instagram will know I sometimes suffer crises of confidence and post photos of potential work outfits to check people think they are office appropriate. Number 6 is a cute playsuit I bought in the ASOS sale that I love, but wasn’t sure if it was right for work. One of the obvious things that holds me back is having to get down to my undies to go to the loo at work feels really weird. Another thing I ran by fellow instagrammers is the dress in photo 3 – it’s this lace waistband skater dress from Missguided – to see whether people thought it was dress-y enough for a wedding. Even though I’ve been to a few weddings in my time I’m never 100% sure on what’s right for a wedding and what’s not but I feel comfortable and nice in this dress and I think that counts for a lot. I’ve also bought these shoes from Daisy Street to wear with the dress – I love how the red sole makes them feel a bit like Louboutins! The shoes in number 11 are also from Daisy Street and an absolute steal at £19.99 in the sale. They also have red soles! I think they’ll be being worn to a hen do I’m going to this weekend – I’m off to Brighton tomorrow morning to celebrate one of my very best friend’s impending wedding, and the theme is ‘hula girls’. Whilst others have gone for coconut bikinis and grass skirts I am not really a great fancy dress lover so I’ve gone for a Hawaiian print bodycon dress and purchased lots of Hawaiian lei to jazz it up a bit. The hen’s sister has booked a party bus and we’re going for dinner at Revs and a few destinations before ended up at Oceana… I am slightly scared, haha! The 12th photo is a Congratulations card and bunch of flowers that Tom kindly bought me to say well done for getting a secondment to another branch at work. I’ll be moving from our head office in Southampton to our Training Centre near where we live now to look at our training courses and eventually deliver training (scary!) It’s a really good opportunity but one I’m slightly nervous about as it’s unlike anything I’ve done before. I always try and push myself to do new things and develop new skills at work so I know it will be a really good experience. The only downside is that I’ll no longer be on call as a Press Officer which means that I’m taking quite a significant paycut. I hope that things like no longer having a two hour commute every day and doing something more challenging will balance it out but it will probably mean I feature new things I’ve bought less on here as I won’t be able to afford all the splurging on clothes I currently do!